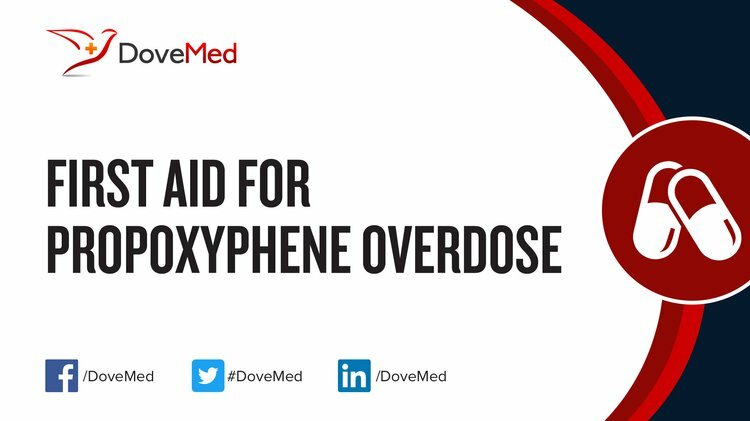 Propoxyphene Overdose is the accidental or intentional intake of the drug in dosage higher than prescribed values. Note: Propoxyphene is not used in medical treatment of humans in the US, due to its potential for causing severe heart conditions. What are the Causes of Propoxyphene Overdose? What are the Signs and Symptoms of Propoxyphene Overdose? The signs and symptoms of Propoxyphene Overdose can vary from one individual to another. It may be mild in some and severe in others. Several systems of the body, such as the muscular system, nervous system, vascular system, digestive system, lungs, ENT, skin and sight may be affected. How is First Aid administered for Propoxyphene Overdose? Who should administer First Aid for Propoxyphene Overdose? First aid for Propoxyphene Overdose is administered by healthcare professionals. What is the Prognosis of Propoxyphene Overdose? How can Propoxyphene Overdose be Prevented? Ray, W. A., Murray, K. T., Kawai, V., Graham, D. J., Cooper, W. O., Hall, K., & Michael Stein, C. (2013). Propoxyphene and the risk of out‐of‐hospital death. Pharmacoepidemiology and drug safety, 22(4), 403-412. Raffa, R. B., Burmeister, J. J., Yuvasheva, E., & Pergolizzi Jr, J. V. (2012). QTc interval prolongation by d-propoxyphene: what about other analgesics?. Expert opinion on pharmacotherapy, 13(10), 1397-1409. Cole, J. B., Sattiraju, S., Bilden, E. F., Asinger, R. W., & Bertog, S. C. (2012). Isolated tramadol overdose associated with Brugada ECG pattern. Pacing and Clinical Electrophysiology, 35(8), e219-e221. Boyer, E. W. (2012). Management of opioid analgesic overdose. New England Journal of Medicine, 367(2), 146-155. Meehan, T. J., Bryant, S. M., & Aks, S. E. (2010). Drugs of abuse: the highs and lows of altered mental states in the emergency department. Emergency medicine clinics of North America, 28(3), 663-682. Okoye, C. N., Okoye, M. I., & Lynch, D. T. (2012). An analysis and report of custodial deaths in Nebraska, USA: part II. Journal of forensic and legal medicine, 19(8), 465-469. Schuller, J. L., & Krantz, M. J. (2012). Synthetic opioids and arrhythmia risk: a new paradigm?